Diane Rilling Cook 3 hrs · This is what Christmas season is all about. My sister & brother-in-law started this ministry 14 years ago in memory of my niece Kylene. Beginning this weekend, volunteers will deliver homemade cookies to parents who have lost a child. FLORISSANT, Mo. — On a snowy Thursday morning, Deb Bronder and her husband Pat were busy inside Trinity Church in Florissant, preparing Christmas cookie bags. There were thousands of homemade cookies of every size, shape and flavor from chocolate chip and oatmeal, to cookies shaped like Christmas trees and Santas. 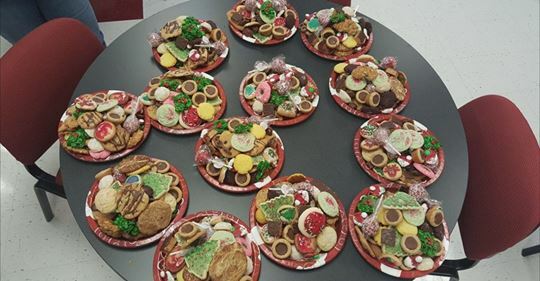 “We put anywhere between two and two and a half dozen per plate,” said Deb Bronder.Beginning this weekend, volunteers will deliver homemade cookies to parents who have lost a child. Why cookies? Ky, short for Kylene, is the oldest of the Bronder’s three children. A 2004 horse accident killed her. Ky died after getting kicked in the chest. “Ever since she was two years old, she just had a fascination with horses,” said Deb. "She did have a passion for horses. That's why she was working at the stables. She just loved being there." Ky’s love of cookie baking inspired her parents. The first year, they delivered Ky’s Cookies to 35 families who lost a child. This year, well over 500 families will get cookies. "The most significant part is being able to approach a parent, hand them a gift and say their child's name. That means more to a parent than anybody could know. It's a song to their heart." Pat estimates he’s delivered tens of thousands of homemade cookies since 2004. He’s seen great appreciation for the kind gesture, as well inevitable tears. For information on how to donate cookies, click here or email knowingyou@sbcglobal.net. A Mercer County native has won the Agriculture Educator Lifetime Achievement Award at the Missouri Livestock Symposium. University of Missouri Extension writer Duane Dailey of Columbia received the award, which honors an educator making significant contributions to agriculture in northeastern Missouri. Dailey says he “taught through the media” for 57 years and writes science stories and talks about MU research on forages, cattle, and economics. He shares beef reproduction research to help farmers boost profits and save time and promotes fixed-time artificial insemination. Dailey wrote economic outlooks from the MU Food and Agricultural Policy Research Institute for 30 years, has a bachelor’s degree in agricultural journalism and a master’s degree in extension education. He retired 23 years ago after serving as an extension professor and news director in MU Ag Information. Dailey is also an award-winning photographer and was a co-director of the Missouri Photo Workshop for 15 years and was inducted into the Missouri Photojournalism Hall of Fame in 2007.